#231 // So that was Wednesday. Today went a little like this. 1.15pm Off for lunchtime trip to the bank to open Help to Buy ISA. Am massive grown up (ahem..about time at 30-year old...give self side-eye). 2.10pm Back at desk. May actually be able to own house. One day. 2.33pm Really need to go to gym. Signs up for 6.30pm class. 3.58pm Really need chocolate. And I am going to the gym late *buys sea salt caramels. * But not just any sea salt caramels. 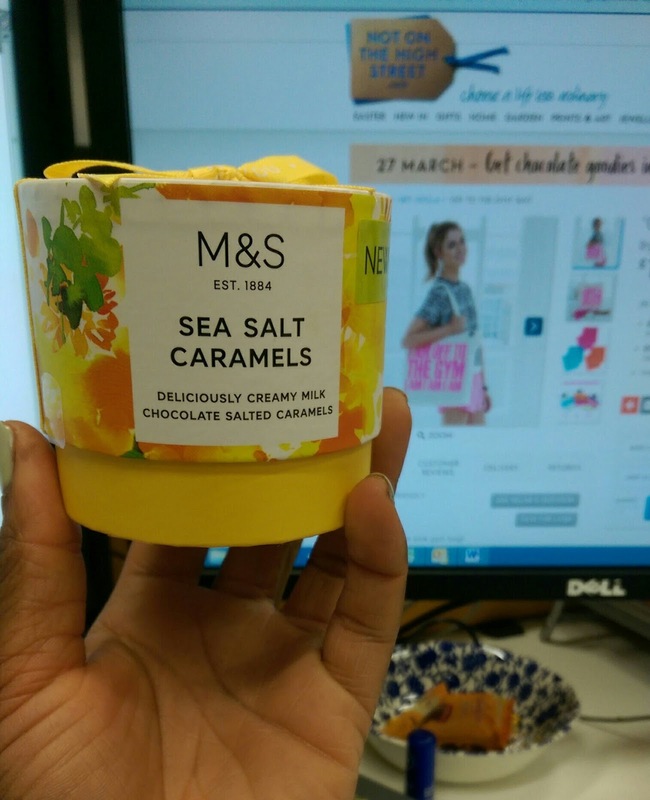 M&S ones baby! Well, if I'm going to go over my Weight Watchers points allowance, I'm going to do it properly. 5.43pm Train is supposed to on platform, so I can get to step class. Train is not on platform. 5.49pm Knew I should have taken gym kit with me. Should have foreseen this random desire to move my booty. 6.22pm Have somehow power-walked home, changed into gym clothes, had a phone call with the bf and left the house in 14 minutes. 7.58pm Will improve day by having bath. 8.08pm Let's top up the hot water. 8.52pm A yummy dinner saves the day. Screw the points.